Have no fear with this big, versatile distortion in your signal chain. 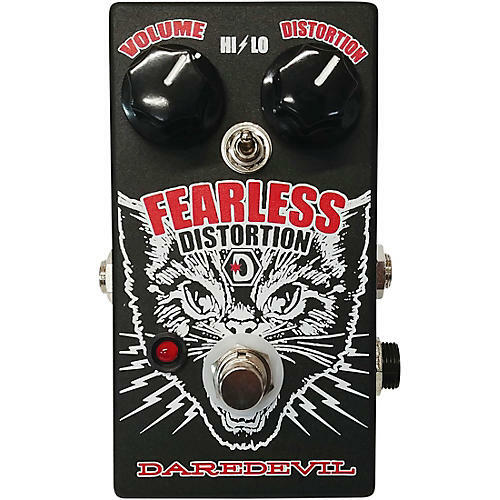 The designers at Daredevil Pedals wanted to design a distortion pedal that did more than just the usual one-type-of-gain approach. The Fearless goes far into head crushing, "Marshall on 11" territory, but also bluesy warm drive or more subtle gain boosts. There are two settings, Hi and Low, with controls for Master Vol and Gain. The sound is warm and vintage, but also high output with a lot of cut. The high-gain setting is dialed in to be huge — big lows, open and almost blown out. No overly compressed, shrill high end; none of that all-or-nothing gain setting. Run it through some loud, clean vintage amps and get dynamic distortion, harmonics, and big round tone response. Or hit your dirty amp tone for a giant solo boost that sings. A full sweep of different dirt to get what you want out of your rig. Like everything else from Daredevil, these are hand wired in Chicago, feature true bypass, take either 9V battery or external DC jack.